Very happy. Had purchased a box of 4 of these about a year ago, so now filling out a large set. Have other Michaelangelo series glasses (wine), also in boxes of 4. Had seen an equivalent item (not sure if it was the same seller) that is now unavailable, also 6 to a set, but customer comments reported receiving 4 to a set. Not sure what the intention is, but I ordered 2 sets and received 3 boxes of 4. All arrived intact (the 3 boxes were in 1 large elongated carton with styrofoam peanuts). 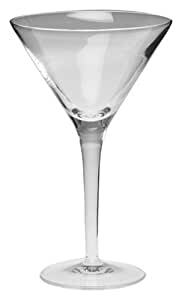 Ever buy a Martini and have it served in a glass that resembled a saucer on a sick only to have most of it on your shirt,shoes and floor before you can even get it to your mouth??? Well, not with these puppies. Their nice and deep so your martini stays there until you are ready to enjoy. The first time I purchased this it came with 3 glasses broken. They quickly sent me another box. Well, in this, my second shipment, 4 glasses were broken. They need to write fragile or something on the box because the post man just throws it on the doorstep.